There’s room for everyone but will everyone benefit? 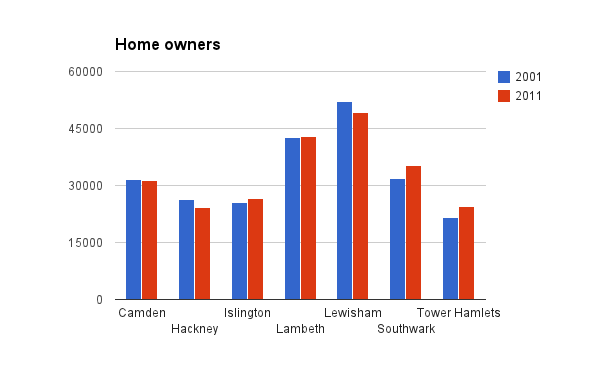 There are more and more people living in inner London. Some residents are benefiting more than others from this trend. The principle question this raises for public policy is how to ensure that any new wealth that is created is shared more equally. You might be surprised to hear that the population of inner London is increasing. Surely the poor and those on middle incomes are being priced out by foreign billionaires! Some articles on this topic remind me of the old joke about New York, no one drives, there are too many cars. Robbie de Santos‘s piece for Changing London is too nuanced to fall into this trap. In it he argues that, in rapidly gentrifying areas, more should be done to provide housing that households on £30-45,000 per year can afford. 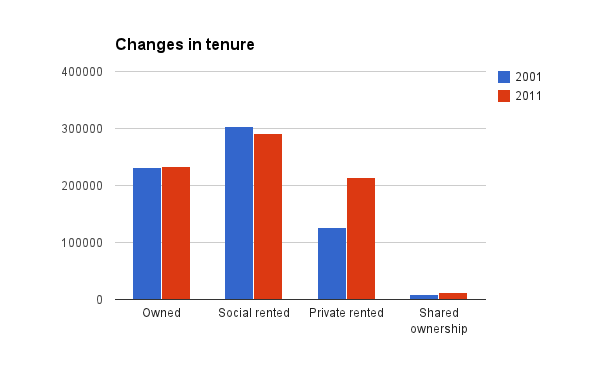 Dave Hill at the Guardian has already pointed out that it might be controversial to argue for increasing spending on shared ownership housing when the amount being spent on social housing has been cut so dramatically. 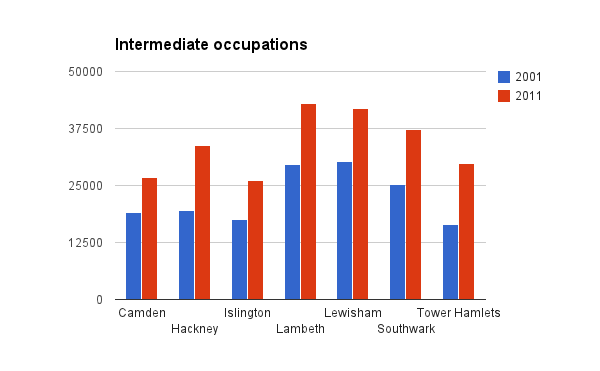 In addition to this we need to remember that the population of inner London is increasing. 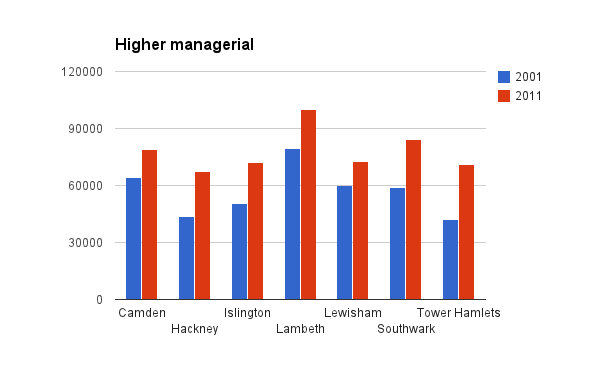 As a result there are now actually more people on middle incomes living in inner London than previously. 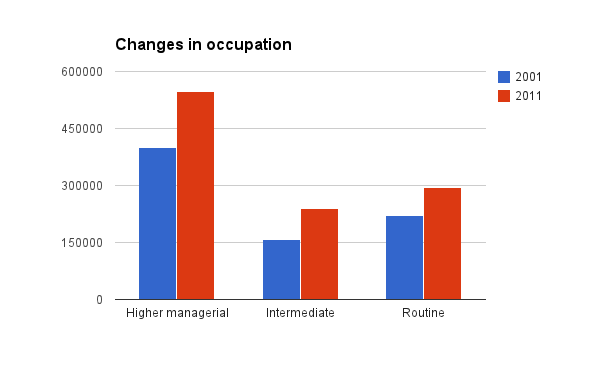 This chart (all data from the 2001 and 2011 census) shows the significant increase in the number of people in ‘intermediate occupations’ living in a few inner London boroughs. This is what the overall picture looks like. Although some people on middle incomes may be being priced out of inner London, overall the number of people on middle incomes living in inner London is increasing, as is the number of people on high incomes, and on low incomes. 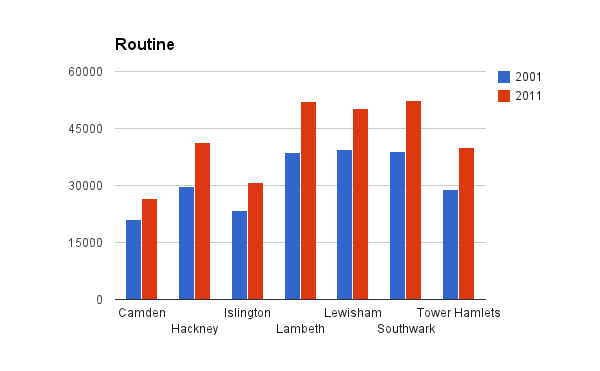 How is the increased population of inner London being housed? 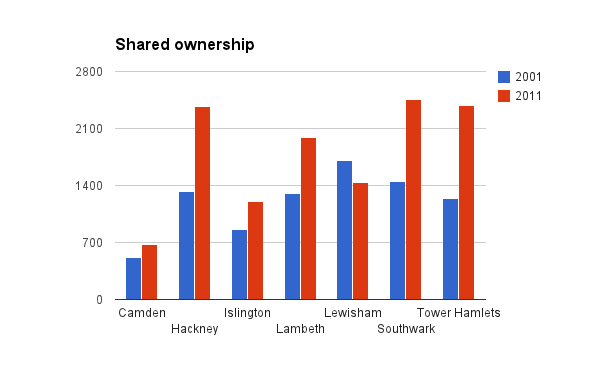 Robbie will be glad to see that there has been an increase in the numbers living in shared ownership, although this still accounts for a very small number of people. There has certainly not been a general increase in the number of people who own their own home (although those that do have, on paper, in general made a lot of money). And there has been a noticeable and much commented upon decrease in the number of people who rent from housing associations or local authorities. Most importantly, there has been a dramatic increase in the number of people who rent privately (lots of these will be houses that have been split into flats). 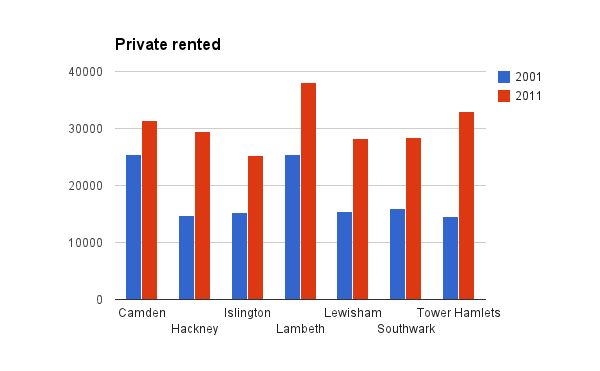 This chart puts the rise in private renting into perspective. The story then is not so much that people on middle incomes are being prices out of the inner London boroughs (although some may be and more may be being priced out of certain neighbourhoods within these boroughs). 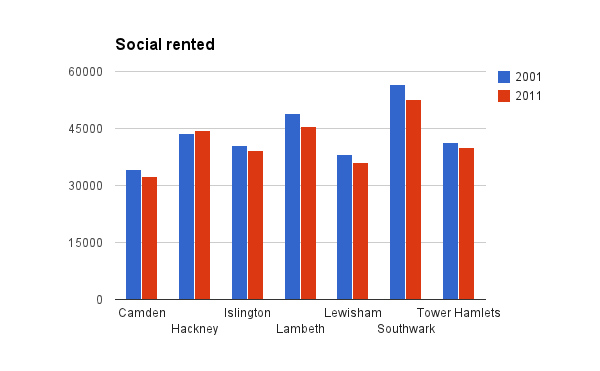 In fact, there are more people on middle incomes living in the inner London boroughs but they are more likely to being renting privately than people on similar incomes would have been a decade ago. This means that rising house prices do not benefit them and in fact probably harm them, since their rents go up. Robbie’s argument is not only that people on middle incomes are increasingly being priced out, but also that this has a negative impact on community life and the diversity of businesses in an area. This is an interesting argument. I am not sure that the splits between tenures by itself, can guarantee much about community life, which is as much a result of interaction and institutions as it is a result of population composition. However, if we look that the situation in terms of how the new wealth that has been created by the increased population can be shared more fairly perhaps we get different answers (some earlier thoughts from me on a related topic can be found here). For example, we might start thinking about how newly built houses can be part of community land trusts, so that increased housing wealth is invested in the community and does not just go into the hands of the owners. Similarly, there may be a case for more flexible local property taxes and co-operative ownership of local businesses. Who knows how long the current increase in population in inner London will last. As long as it does the key questions are how we can build enough houses so that rents do not force people into poverty and overcrowding and how we can spread the newly created wealth so that everyone, not just home owners, benefit. This entry was posted in Article and tagged gentrification, housing, housing policy, inner London, public policy by Thomas Neumark. Bookmark the permalink. (iii) We have to bear in mind that some of the mechanisms which exclude people from high-rent areas will only have shown their effects SINCE census day in 2011: the HB etc caps and the overall benefit cap, plus some more years of rent/price escalation. It’s thus quite possible that there have been absolute declines in the low- and middle-income populations of inner london in these last years as well as the only-relative declines which you identify for 2001-11; Alex Fenton (ex Cambridge, now LSE) who did those forecasts of HB-cap impacts might know. (iv) and of course small-area analysis would be brilliant.